You can now sell your photo downloads, prints and gifts in one of the following currencies : USD, EUR, AUD, CAD, NZD or GBP. Your customers will certainly love seeing the prices in your local currency if you decide to make use of this new feature. 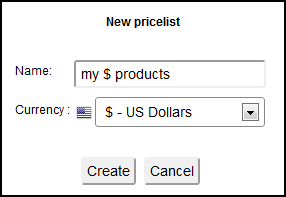 Each of your price lists can have only a single currency. Before this change, a new price list was created simply by entering its name. Now both the name and a currency are required. The coupons are now bound to a currency. A coupon in one currency cannot be applied to products sold in another currency. Although you can have multiple price lists - each in a different currency - and apply them to various albums, your customers cannot combine products sold in various currencies within a single shopping cart. E.g. : if their cart contains a product sold in USD, they cannot add a product sold in EUR unless they empty their cart first. Each checkout is hence in a single currency and your sales page displays the profit, the net profit, and the fee in the currency of each sale. When setting up your selling price, you specify it in the price list's currency. This has a drawback for products provisioned by the lab, as their base currency is specified in USD. The base product price is always re-calculated according to the exchange rate at the time of sale. The consequence of this is that your profit can change according to the current exchange rate. If it happened that the exchange rate changed so as to put the sale price below the base price, the affected products would be disabled to protect you from financial loss. Your profit, will probably be large enough to compensate for the currency rate changes, but you are safe even if it is not. The previously mentioned possible drawback of using a different currency does not affect digital downloads, as they have no base price. USD remains our settlement currency and your profit as well as your payouts are calculated according to the exchange rate on the day of each sale. You can see each the used exchange rate on the sale details page by clicking "Show Summary". Payouts will also continue to be sent in USD as before. The currency rate is updated twice daily. The used spread is 3% which is the spread we usually get from our payment providers. The various currencies can have different processing fees and checkout options. Please refer to the feature list for details on fees and checkout options.